Finally some warmer weather (at least in some parts of the Maritimes) and with it some more butterfly species. Highlights from the last couple of weeks include the first Monarch (Jane Leblanc at West Quaco, New Brunswick, May 25), first Meadow Fritillary (Tony Thomas, Fredericton, May 25), first Bog Elfin (Phil Schappert, Pockwock Watershed Rd, NS, May 22), and first Eastern Pine Elfin (Derek Bridgehouse, Chester Basin area, NS, May 28). I am especially excited about the Meadow Fritillary record, that species wasn’t reported in the first year of the Atlas! So how does this year’s cold spring compare to last year’s warm spring? There have been 21 species reported this year, and there are undoubtedly a few other species that have been documented but not yet reported. However, last year by May 29, there were a whopping 35 species reported! Clearly the weather makes a difference in the emergence date of butterfly species. Sarah Robinson and I made an interesting discovery on Wednesday at Lakeville, Carleton Co, NB. 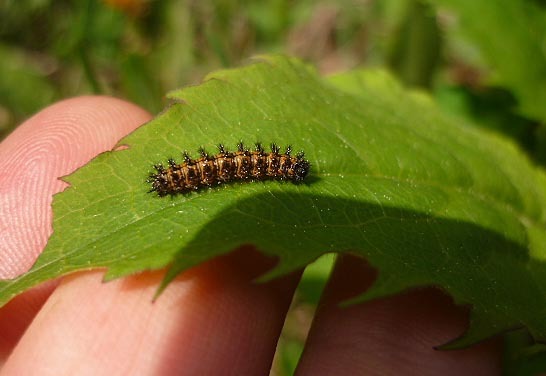 While surveying for pollinators we found Harris’s Checkerspot caterpillars on a rather unexpected foodplant: Large-leaf Aster. Every publication on Harris’s Checkerspot I have seen lists only Flat-topped White Aster as a host. We will be returning to the area in the coming weeks and will monitor these caterpillars. 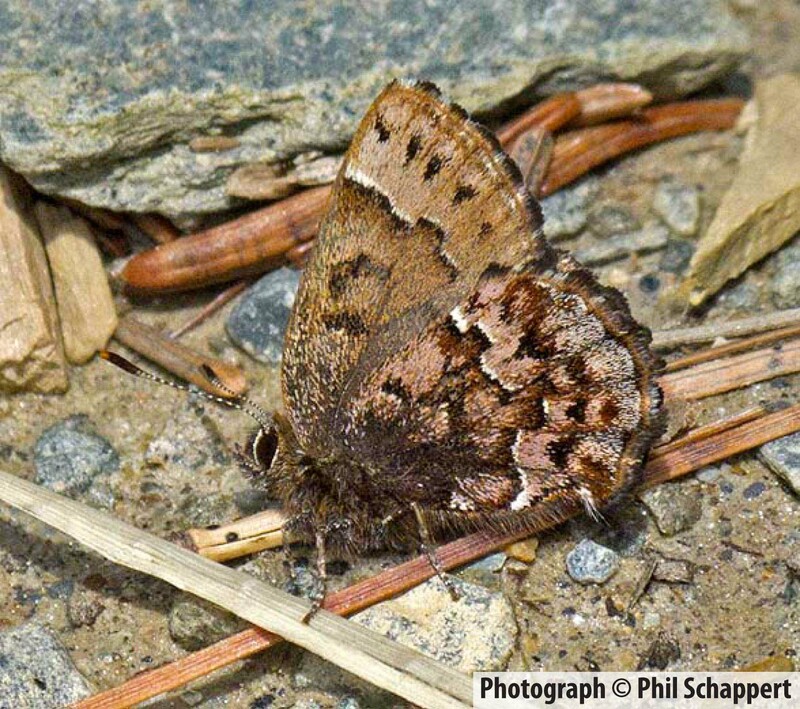 The next couple of weeks should see the emergence of a number of common species including Arctic Skipper, Hobomok Skipper, Canadian Tiger Swallowtail, and Silvery Blue. Rarer species to keep your eyes out for these days include the elfins, Meadow Fritillary, Juvenal’s Duskywing, and Jutta Arctic.